WASHINGTON, April 19, 2017--The U.S. Department of Agriculture (USDA) today announced new data indicating the organic industry continues to grow domestically and globally, with 24,650 certified organic operations in the United States, and 37,032 around the world. 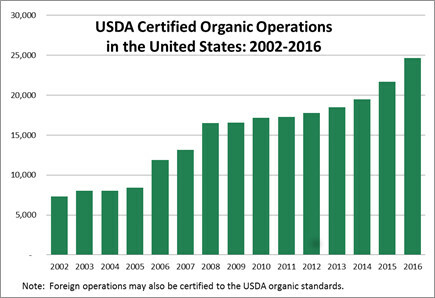 The 2016 count of U.S. certified organic farms and businesses reflects a 13 percent increase between the end of 2015 and 2016, continuing the trend of double digit growth in the organic sector. The number of certified operations has increased since the count began in 2002 and this is the highest growth rate since 2008. Organic certification is an “opt-in” voluntary standard that is managed through a public-private partnership. The USDA accredits and oversees approximately 80 businesses and State governments that directly certify organic farms and businesses. USDA provides a number of educational resources to help organic producers access this growing market. These include interactive videos that help candidate farmers understand how to get and maintain organic certification, and fact sheets that explain the value proposition of organic certification and outline the standards in clear ways. The complete list of certified organic farms and business is available through the Organic Integrity Database of certified operations maintained by USDA-accredited certifying agents. Launched in 2015, the database discourages fraud by providing more accurate and timely information about operations certified to use the USDA organic seal. The database also supports supply chain connections between buyers and sellers of organic goods.